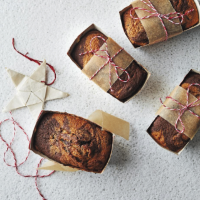 These sweet mini loaves get their pretty marble effect by swirling the clementine mixture and the cocoa-rich mixture together – a match made in heaven. 1. Preheat the oven to 200ºC, gas mark 6. Whisk the butter, sugar, flour and eggs together in a bowl until smooth, then transfer half the mixture to a separate bowl. 2. Beat the milk and cocoa powder into one bowl of mixture. Beat the clementine zest and juice and the chopped chocolate into the second bowl of mixture. 3. Drop spoonfuls of the mixture alternately into the loaf cases then using a bamboo skewer, lightly ripple the mixtures together to create a marble effect. Sprinkle lightly with the extra sugar and bake for 15-20 minutes until risen and firm to the touch. Leave to cool completely before serving. Cook’s tipFor a full-sized loaf, use a 900g greased and lined loaf tin and bake at 180ºC, gas mark 4 for 45-50 minutes.